This super simple DIY avocado banana face mask with coconut oil is very nourishing and it’s made in just a minute! The moisturizing and nourishing properties of of these 3 amazing ingredients give your skin a healthy boost. Banana contains minerals such as magnesium and potassium, vitamin A, B, C and E, antioxidants and other powerful nutrients. It’s great for both dry and oily skin, helps minimize wrinkles and repairs damaged skin. Avocados are full with omega 3 fatty acids, proteins, vitamin A, D and E, amino acids and more. They deeply moisturize the skin and protect the cells against external damage. Avocados also help the skin retain its elasticity and reduce inflammation. Coconut oil is rich in MCT fatty acids, vitamin E and other antioxidants. It’s a very powerful oil for your skin; it moisturizes, protects, nourishes and cleans. Coconut oil has strong antimicrobial properties, repairs skin tissue, stimulates collagen production and improves skin texture. The ideal coconut oil consistency to use for this mask is when it’s soft. You don’t want the coconut oil to be liquid because the mask will be too runny. I usually have two jars of coconut oil; one in the fridge and one in my kitchen cabinet. This way I always have solid and soft coconut oil whenever I need it. If you live in a cold climate or it’s winter now, you’ll need to soften the coconut oil a bit. There is no need to melt it, just use the natural heat of your (clean) hands. The banana and avocado should be very ripe. 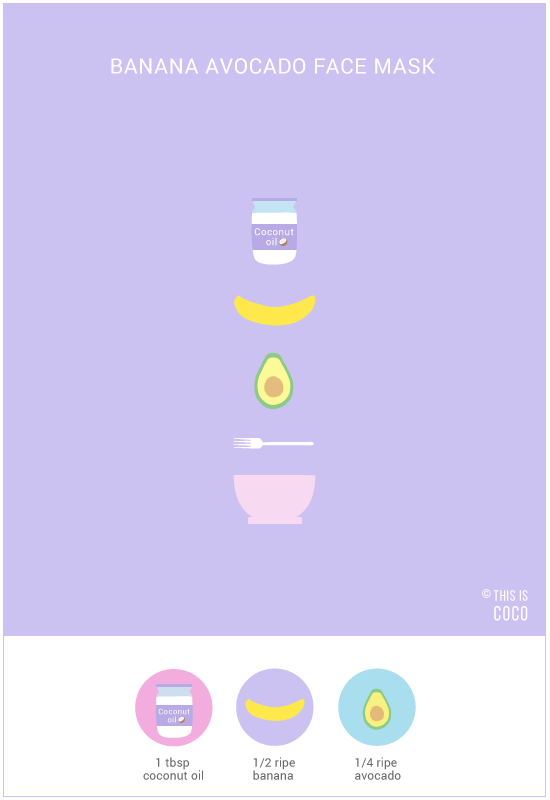 Mash all 3 ingredients and your DIY avocado banana face mask with coconut oil is done! Put the mask on your face and leave it on for 20-30 minutes or longer. This mask doesn’t dry, so it’s best to lay down for a bit and relax. Keep a towel wrapped around your hair and wear clothes that can get dirty. Gently wash the mask off afterwards with room temperature water and dry your face with a towel.